Thermal Transfer Printer Labels - How do they work? 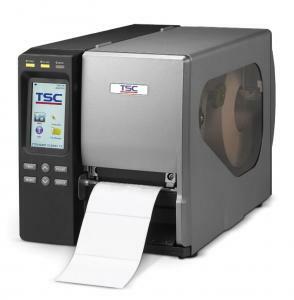 Thermal transfer printer labels work in much the same way as direct thermal printing labels. Thermal transfer printer labels use the same technology in the print head but thermal transfer printers requires a ribbon to provide the colour to the material being printed. Direct thermal technology incorporates the pigment in the paper itself. If your thermal printer has a design to accept ribbons, they will work with both thermal transfer and direct thermal technology. This setting is found in the labelling software and the print driver settings. Call us on 01332 864895 and we will provide advice on choosing both the printing method and material type based on your needs. Thermal transfer printer labels are ideally suited to long shelf life products (including foodstuffs) where a label is expected to be legible for over 6 months. Environmental factors affect the durability of labels so the material has a major impact on label durability. Paper labels will perish in wet or humid environments whereas synthetics such as polypropylene have far long lifespans. Choosing the correct material and adhesive will have a major impact on the viability of the printed label in its intended use. Whereas courier labels require a short lifespan, chemical and hardware products will need longer lifespan labels. Chemical labels themselves fall under resolutions that not only cover what is on the label but also the longevity of the label. Unlike direct thermal labels, thermal transfer printer labels use a ribbon of wax or resin to act as the pigment to mark the label material. 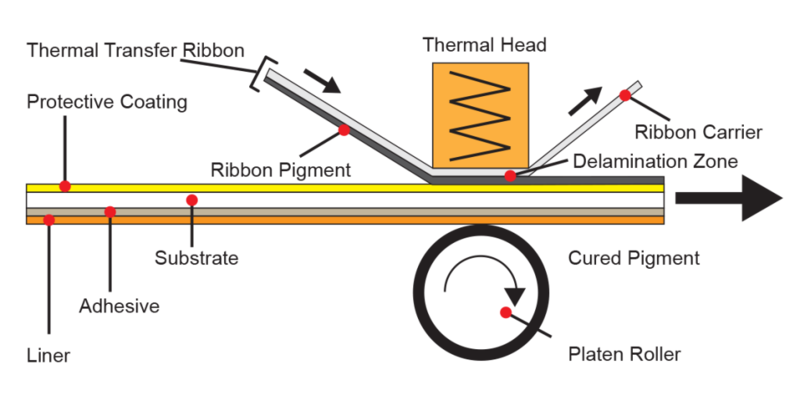 The ribbon sits between the print head and the material being printed and normally moves at the same speed as the material. The thermal print head consists of hundreds of tiny discs that can be heated and cooled near instantaneously. These discs cause the wax or resin on the ribbon to melt and delaminate from its ribbon backing. The melted pigment then fuses to the material being printed to form the image or text. These are the economic solution coming at the lowest price. Wax ribbons are suited to paper but cannot be used on plastics as the wax will not adhere to plastics. Wax is therefore not suitable for uses where the labels might be exposed to moisture or high humidity as it is only suitable for papers. They are only suitable for low-resolution printers of 200dpi really. These ribbon types strike a balance between economy and performance but have limitations. Wax-Resin mix gives a better deeper finish but is only suited to paper-based materials and very specific synthetics. These ribbons can be used on higher and lower resolution thermal transfer printers. They are not really suitable for the highest resolution printers available. These provide a high-performance finish. Resin ribbons will give a superior finish on all materials. It is the only ribbon type suitable for synthetics in general such as polypropylene but comes at a price. Resin ribbon is suitable for use with any resolution of printer and ideal for high-resolution printers up to 600dpi. Thermal transfer printers use the same technology used in direct thermal printers. They have a print head with very low heat capacity allowing elements in the head to be heated and cooled rapidly. Combines with electronics and software drivers, these can convert a digital image into a physical image by “drawing dark lines” in the media. The printers come in a range of resolutions from 200dpi (dots per inch), 300dpi and 600dpi. Printers also come in a range of widths, notably 2-inch, 4-inch, 6-inch and 8-inch width. An 8-inch width printer can accommodate an A4 sized label. Smaller printers can only handle up to the width stated whereas a 4-inch printer can handle 2-inch labels but not vice versa. Printer width does not affect print speed for the printers, however, the higher the resolution, the slower the print speed. 200dpi printers can achieve upto 14 inches per second print speeds. 600 dpi printers will run at 3 or 4-inches per second, as a maximum. Choosing resolution and speed is an important factor in selecting a printer. Barcodes sizes, in particular, are affected by resolution factors – low resolution printers cannot print small barcodes accurately, whereas high-resolution printers can. The speed, width and resolution of a printer all affect price. The more you have of each factor, the higher the price. High resolution, fast wide printers are very, very expensive. In such circumstances, it is often better to resort to sheeted labels and a standard monotone laser printer. We can help advise you on the best solution for your thermal transfer printer. 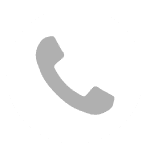 To find out more about thermal transfer printer labels or if you need a supply of printer ribbons and labels or to buy a thermal transfer printer, give us a call on 01332 864895 or fill in the form below and we can get started.